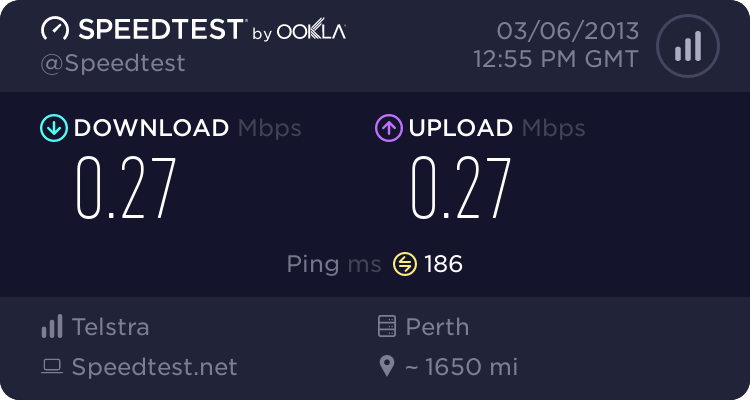 Basically my issue as you may have guessed is slow internet speeds im currently with -Telstrsa Home ULTIMATE Bundle - 200GB- which is suppose to get you 'Fast and Faster speed, i have 31% Data Used. Im also currently using ADSL Elite Liberty-200mb (which i was pretty sure supposed to be ADSL2+) and using a THOMSON TG782T Modem. My cousins family although i have no idea what plan she uses, sometimes gets speeds up to 10.00mbps. This is absolutely OUTRAGIOUS, SCAM. 0.30mbps are you joking me..... I didnt pay over $150 every month for this rubbish service and its been like this for a long time. Previously when i called to your help and service i gave you guys a 8/10 because i thought the issue was solved. 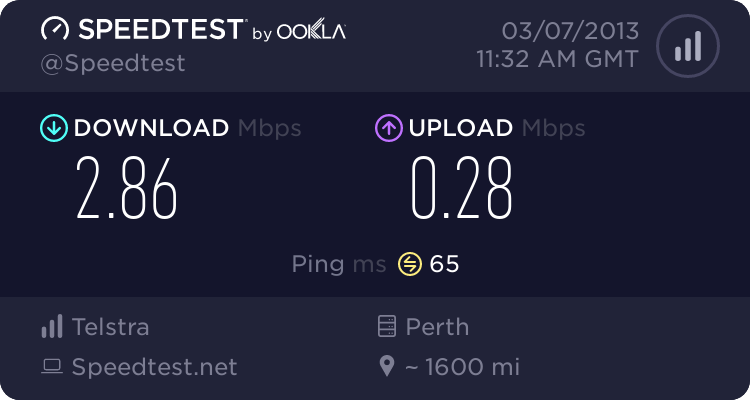 Right now im feeling like a straight 0/10 and are planning to leave Telstra and go with another company and tell all my friends the quality internet ive been having the past year. And you know what i think the speed and the signal strength got worser after i talked to the lady and she configured my modem. The thing i think are causing the problem may be that the Contract end date is -04 Feb 13- if i have to change a plan then i will definitely leaving Telstra. Not happy about this. Please post your Modem Stats, for that modem browse to http://10.0.0.138, go to broadband connection on the left, lick on dsl connection. On the right pane, click on view more then in the top right corner click details. Oh and heres my speedtest right now http://www.speedtest.net/result/2556811321.png its not too bad not like yesterday where i couldnt even open the webpage but its still slow. The internet speed is not constant at all goes really slow to slow to okay speed. Firstly, I'm not obliged to fix anything, so I would appreciate a bit more common courtesy instead of "I hope you fix it this time". I'm a (unpaid) Telstra Customer offering my assistance here as is almost everyone, and I don't take nicely to a demand to provide assistance. Reviewing the 2nd download speed you provided vs. your modem stats, there is a bit of a difference, however that could be related to a number of factors (Speed Test is never 100% spot on). Can you by any chance try an Isolation Test (http://crowdsupport.telstra.com.au/t5/General-Internet-KB/How-to-perform-an-Isolation-Test/ta-p/5501... ) and let us know the outcome (Modem connected directly into the socket with no other devices. Failing all of that, your option for escalation remains Telstra directly, via their phone faults option 133 933. Ill ring them again thanks for your time. Re: The internet speed is unbearable.....and then some! I'm in the same boat! I have the same bundle, same modem and have just lost 45 minutes of my life I'll never get back speaking to a guy who didn't answer my questions or solve my problem. Your line speed is 555 kbps (0.56 Mbps). Your download speed is 69 KB/s (0.07 MB/s). I'm not I.T. guru, I just know I need my internet for my studying and last time I checked any numbers AFTER a decimal point indicated LESS than ONE. So even though he told me (after asking 5 times what I should be receiving)... "you should be getting 24MB." "Yes, I realise I SHOULD be, but I'm getting less than ONE MB!" He tried to tell me that was okay. Am I missing something here? He told me "On March 16th you used too much internet." "So you're telling me I exceeded my limit of 200GB and it's slowed down? I find that hard to believe, my usage is usually about 3GB?" "What's correct? That I exceeded my limit OR my usage is 3GB?" "Yes, that's right. Is there anything else I can help you with?" "Sorry? Are you finishing the call now? You haven't solved my problem yet." I felt like I was in an Abbott & Costello movie..."Who's on first?" ring any bells? So now he's filling out a report. I asked if I was to wait on the line while he did that or was he going to make the report after the call? Apparently after the call. SO when were you going to tell me what you are actually doing to fix my speed problem? Oh, someone will contact me. When? In 10 minutes? WHAT???? IN 3-4 BUSINESS DAYS????? I don't think so! That's totally unacceptable. In fact, I'm suprised I can even upload this as my connection is atrocious. I was then asked to take part in the survey...how likely am I to recommend Bigpond? ZERO! We have a similar problem. I rang Telstra weeks ago to complain about my slow internet. The woman at Telstra told me, yes it was very slow and it should be about double that. She said she would get a technician to check things out. Well the technician called and said everything was fine, including the speed. Ever since that time, our internet connection has worsened considerably and drops out on both computers connected a number of times a day. When I called Telstra again I spoke with another woman, very friendly and nice, who said that it was probably our modem which was about 3 years ago and was out of warranty. I explained to her that my 29 year old fridge had died last week and its warranty finished about 27 years ago but it was still working fine for another 27 years. She told me that if we signed up to a new plan we would get a new FREE modem and FREE installation. She said she would get somebody to call us. The person who called us was a salesman and know nothing about how to resolve our problems. The new plan actually would work out a little cheaper, but the modem was not free, neither was the installation. It was also suggested that maybe my connection was slow because we were reaching our download limit, but we have not even used 50% of it. My husband has signed up to the new plan, went to the Telstra shop and bought a new modem and we're now waiting to have it installed. Our internet connection continues to drop out at least 4 times a day. I very much doubt it is the modem, but I will reserve my judgement. I feel like we have been punished by complaining . Hacked Website - Telstra where is the money going when you say the process was interrupted.